A personnel file is a paper or electronic folder for storing HR and payroll documents related to new, existing, or past employees. It should include basic employee and compensation information in compliance with federal and state labor laws. Understanding what employment records to store in a secure personnel file helps you avoid potential mistakes and fines. If maintaining personnel files including job applications, emergency contact information, payroll, benefits enrollment forms, and tax documents seems overwhelming, you can use payroll software like Gusto to store employee documents online, track PTO, and create a checklist for each employee to make sure their personnel files are complete. Click here for a free 30-day trial. 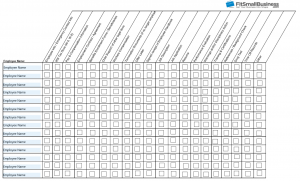 You can download the checklist and edit what’s included at your company. The first section shown in blue are the must-haves. The column on the left can be used with a check mark (✔) or date that each document was added. Modify the form to list the name of each document in the middle column. There’s room in the notes column to denote any remarks, such as to remind yourself when the next performance review is due. The personnel file audit checklist can be used to document what’s missing in all employee files as you build or audit your personnel folders. List your employee’s names down the left-hand side. The document names are shown at the top. Use a check mark to show which documents you have. Any blanks left will show you what’s missing. You can then follow up with employees to obtain needed documents using the five steps we’ve listed below. The documents within an employee’s personnel file should cover the entire life cycle of their employment, from offer letters and W-4 forms to performance reviews and termination paperwork (including an employee’s exit interview). The personnel file can be either a physical folder with printed paperwork or stored electronically using payroll software like Gusto. The list of what encompasses a complete personnel file is long; therefore, we’ll divide it into three shorter lists—must haves, nice to haves, and optional items. There are eight employee-related HR documents that every personnel file must contain, which includes legal employment records such as payroll tax forms as well as employee-employer agreements. Termination documents, such as reasons why the worker left or was fired, unemployment documents, insurance continuation forms, etc. These next 10 documents are not required, but are often included in an employee’s personnel file. They may need to be accessed by the employee’s manager, payroll clerk, or the employee. They include job and employer-related files such as the job application, performance reviews, and employee time-off records. *In some states, sick time-off records are required to be kept. If they’re not maintained electronically within your payroll system, then it’s a good idea to keep them in the employee’s personnel folder. If all of this gets complicated as your business grows, you can outsource payroll or use an all-in-one HR, benefits, and payroll software like Gusto to help track documents and manage paid time-off and benefits. Gusto provides online document storage, including copies of employee contracts, policies and a copy of your employee handbook. Gusto also has electronic signatures, so your online forms are valid. You may also want to use our checklist above for each employee to make sure their files are complete. Or, schedule an annual audit of your personnel files to ensure that none of the must-have documents are missing. It’s better for your business to verify that files are in order in advance of any potential government compliance audit, such as a payroll or labor audit. Here are suggestions on where to store those types of documents that should not be kept in an employee’s personnel folder. Consider putting all I-9 forms and related documents that verify an employee’s right to work in the U.S. into a separate folder. Immigration Services representatives, as well as authorized personnel from the Department of Homeland Security (DHS), are entitled to inspect I-9s. You may want to limit what agents are able to view by keeping I-9s separate from employee personnel information. The EEOC provides a voluntary option for job candidates to self-identify their disability or veteran status (maintaining records related to these documents is required if you have 100 or more employees). It’s suggested that you keep this documentation separate from the employee’s personnel folder; managers should not have access to view this data for risk of discriminating against an employee in a protected class. Online Applicant Tracking Systems (ATS) typically store EEOC information separately from each new hire’s job application and resume; HR can see it but interviewers and managers can’t. HIPAA’s medical information privacy laws require you to protect the confidentiality of your employee’s medical records. If you have staff who have given you doctor’s notes or other documentation, such as for a medical leave, keep these health-related documents separate. For example, if an employee requests maternity leave using FMLA request forms, keep those in a separate, secure FMLA file that no one has access to but you and your HR manager who is responsible for leave benefits administration. An employee’s manager should not be allowed to see confidential health information within an employee file. Business owners don’t always realize the importance of setting up personnel files until they’re audited or served with a lawsuit. If you are operating in hindsight and nervous about getting everything set up for employees who already exist, don’t stress. Use the two templates we’ve provided above, along with the five steps below, to get your employee file folders set up and in order. Creating personnel files is a project, but a manageable one that is well worthwhile; it takes only five steps. Use the employee file folder checklist listing what you want for each file, as it includes our list of forms from above. Then document what you already have and what you need from each employee. Each person might require their own list. 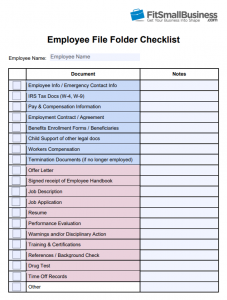 You can customize the employee file folder checklist above for that purpose. Hold a company-wide meeting and explain why you are creating personnel files. Explain that it is best for the business to have solid employment documentation. Let employees know that you may need their help to gather information that’s missing, such as their emergency contact information or copies of their resume. Give each employee their individual checklist showing what you are missing. If there is anything the employee does not want to give you, such as educational transcripts, you might put your guard up as perhaps there is something they may have fudged in order to get the job. Don’t assume though—just ask the employee why they do not want to provide all the information you need. Set a due date of one week for all employee documents to be in and complete. If you give employees a longer deadline, they may forget. Then, store your documents either in the cloud, a payroll or HR software system like Gusto, or in secure file folders in a locked file cabinet. This is the easier situation of the two to be in. If you are reading this, you may have just hired your first employee. Figure out what paperwork you want from the list above or use the checklist we’ve provided. If you want to use payroll software like Gusto, HR software like Zoho People, or document storage like Dropbox, you can often create an onboarding checklist directly in the software and upload all paperwork into the electronic storage system for each employee to complete. Being compliant with federal and state law is an important aspect of being an employer. You’re required to maintain employment data and personnel files. Here are the best practices, as well as what is required by law, at the federal and state levels. Labor laws apply to all employers covered by federal anti-discrimination laws, which is typically any employer with 15 full-time employees or more. However, the following laws apply to all businesses, and each agency has its own document retention requirements and/or guidelines. The Equal Employment Opportunity Commission (EEOC) requires that employers keep all personnel or employment records for one year. If an employee was fired, their personnel records must be retained for one year from the date of termination. 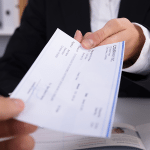 Under the Age Discrimination in Employment Act (ADEA), employers must keep payroll records for three years. Additionally, employers must keep on file any employee benefit plan (such as pension and insurance plans) and any written seniority or merit system for the full period the plan or system is in effect and for at least one year after its termination. Under the Fair Labor Standards Act (FLSA), employers must keep payroll records for at least three years. In addition, employers must keep all records for at least two years (including pay rates, performance reviews, seniority and merit systems, and collective bargaining agreements) that explain the basis for paying different wages to employees of all genders in the same establishment. You can find more on required documentation by reading our article on what records to keep and for how long. State laws on personnel files revolve around whether or not an employee has a right to look at their personnel file. Many states have a provision that allows employees to request copies of documents in their files. The other states have the potential for an employee to see their personnel file by filing a lawsuit. 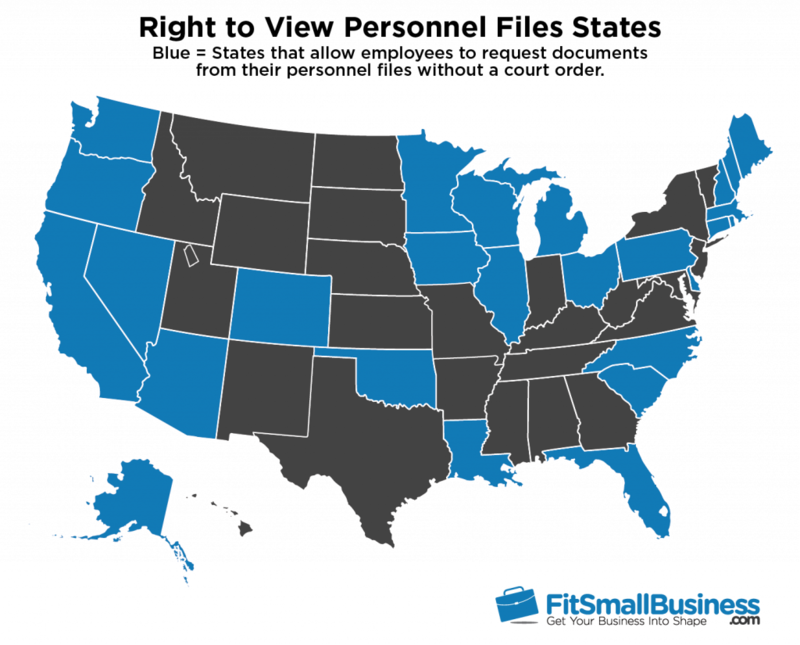 The following states allow employees to see some or all of the documents in their personnel folder; many states are quite specific about what exactly employees are allowed to view. Others allow the employer to charge reasonable fees for document copies. For example, in Florida, employees may only view information related to exposure to toxic substances, and in Arizona, only payroll records can be viewed. Please see your state’s Department of Labor (DOL) website for more specific details. Public (government) employees are allowed to view their employment documents in most states. At the time of publication, “right to view personnel file” states include: Alaska, Arizona, California, Colorado, Connecticut, Delaware, Florida, Illinois, Iowa, Louisiana, Maine, Massachusetts, Michigan, Minnesota, Nevada, New Hampshire, North Carolina, Ohio, Oklahoma, Oregon, Pennsylvania, Rhode Island, South Carolina, Washington and Wisconsin. A good resource for state-by-state updates on these laws can be found on the HR Specialist. Employment records have traditionally been maintained in manila-style folders in locked filing cabinets. However, that’s no longer the best place to store confidential employee files. Physical files can be stolen, misplaced or destroyed. And if you forget to lock the filing cabinet, it’s possible that employee information will be seen by those who have no right to view it. 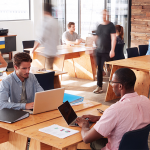 SHRM also cautions that employers must give special consideration to where and how they maintain these files, limiting access to only those with a need to know and protecting applicants and employees from discrimination, identity theft, and breach of privacy. For example, if a manager looking at a worker’s time-off information happens to see medical notes in the employee’s file, that would constitute a HIPAA violation. Therefore, we’ve provided five options for how you store your employees’ personnel files securely. It’s a myth that you need a filing cabinet full of paper personnel files. In fact, it’s legal and advisable to store all of your employees’ personnel files in the cloud or a web service in order to prevent security issues or to avoid losing them entirely to a flood or fire. Payroll software Gusto Payroll software ensures compliance with mandatory personnel forms (taxes, etc.) You may need to customize the onboarding process to have additional items included, like your handbook. You will have to remember to upload other forms like performance reviews. HR software Zoho People HR software ensures compliance similar to payroll software. They also have features including recruitment, onboarding and performance management, housing all documents in one place. These are bigger systems in general, and may take more time to implement because HR systems reach into many categories, from taxes to benefits to goal setting. It’s often a more expensive option. Document storage service Dropbox It’s inexpensive and simple—you drag and drop your files and then protect them with a password. You will have to remember to do everything yourself—or hire an HR person or consultant. File management can take 10-20 hours per employee per year. That’s a lot of time and there’s no compliance guarantee. Your computer server Not applicable It’s simple—just scan files in and create password protected files. No extra cost. The same as above—you have to do everything yourself, with no guarantee that files are correct or accurate. Paper files Not applicable It’s simple—give an employee a packet of papers and then create a file. This is also inexpensive, aside from printer ink, folders, and a locked cabinet. It’s archaic and insecure—even locked file cabinets can be tampered with, and if your building has a flood or fire, you could lose everything. Most payroll providers, including Gusto, allow your employees to electronically sign and store files in a paperless system. This helps your office remain somewhat paperless, as documents like paystubs are also online. In addition, when it comes time to purge records, you can do so electronically. No need to pay for storage or shredding of documents after their retention dates have passed. Example of electronic signature and storage of employee documents using Gusto. Most of the software and services we recommend provide for online document storage. You can read more about the best providers in our article on best payroll software. Think of personnel files as a track record of important paperwork for your employees. Personnel files can be viewed during a government audit or subpoenaed in case of a wrongful termination lawsuit. Those are both good reasons to maintain accurate up-to-date files. Cindy was fired from your company for performance. She had three poor performance reviews in 18 months, and she was not meeting any of her goals. You terminated her employment for performance and gave her two weeks of severance pay in lieu of two weeks’ notice. A few days later, you get a call from an HR attorney. Cindy has claimed she was fired for being over the age of 40. She says you are discriminating against her because of her age. You look in her file and find nothing in the folder but tax forms and her job application. Her performance reviews were not filed. It’s now your word against hers. You may need to call your attorney. Prevent this: Document employee performance reviews in the staff member’s personnel file and also include your reasons for termination, such as notes on constructive performance conversations. Documentation of why Cindy was terminated wouldn’t completely prevent her from suing for wrongful termination, but it would make clear the reason why she was terminated and the poor performance that led up to it. Better yet, also have an employee handbook and obtain employees’ signatures on any policies such as anti-discrimination or harassment prevention that require reporting of any incidents. Johnny was a part-time independent contractor with your company whom you chose to terminate because you needed a full-time employee in the office. You offered the role to Johnny and he said no; therefore, you posted the role on Indeed, found a great candidate and hired them. A day later, you hear from an attorney for Johnny who says you broke an implied contract. You have no idea what he is talking about. You look in the personnel file for Johnny’s contract and the contract you have in the folder is more than a year old. You look through your emails and see that your boss wrote Johnny said he could keep working through January 1st, which is several months away. Johnny now has a case against you. Prevent this: Every contractor agreement, employment contract, and any other document of a legal nature should be kept in the worker’s personnel file folder and signed by both parties. Contracts also need to be maintained with current dates and/or updated annually as needed. Below are a few questions you may have about employment documents and what to keep in an employee’s personnel file. Employment document retention requirements vary by federal agency and state laws. As a general guideline, unless your state requires otherwise, it’s best to keep personnel files for all active employees and to retain files for terminated employees for at least three years. More information can be found in our article on document retention. How often should personnel files be audited? To make sure you, your managers or your HR manager haven’t forgotten to file an important employment document, an audit of your employee’s personnel files should be done annually by HR. This is a task that can be outsourced to an HR consultant if you don’t have one internally. What kind of records need to be kept for applicants who aren’t hired? To cover your business in case you’re accused of unfair employment practices, it’s best to keep a folder with job seeker information. Documents in this file, including resumes and applications of candidates you didn’t hire, can be purged after one year. If you use an online job board like Indeed, all applications, resumes and communications are available online so you don’t have to maintain paper copies at all. Who should have access to employee personnel files? As the business owner, you will need access to employee personnel files. However, in larger companies, this access is often limited to human resources (HR team members) certified in HR compliance. A best practice would be to ensure that someone with responsibility for HR or payroll is the one managing the employee files. All requests to view documents within those files should come through that person for approval. For example, a manager may request to see an employee’s prior performance review. Or, the payroll rep may need to see a benefits enrollment form in order to process deductions properly. None other than the designated HR rep or the business owner should otherwise have access to the entire file. Personnel files may seem outdated, but they are actually an important part of your business procedures to protect you from liability. They are generally required for compliance (such as if you were audited) and considered a best practice. However, they don’t have to be kept in paper form. We recommend using a secure, cloud-based system for storing your employee’s personnel files, such as using payroll software like Gusto, or an HR software like Zoho People. These are the better options for security and can ensure that your employee data and documents are up-to-date and stored properly.